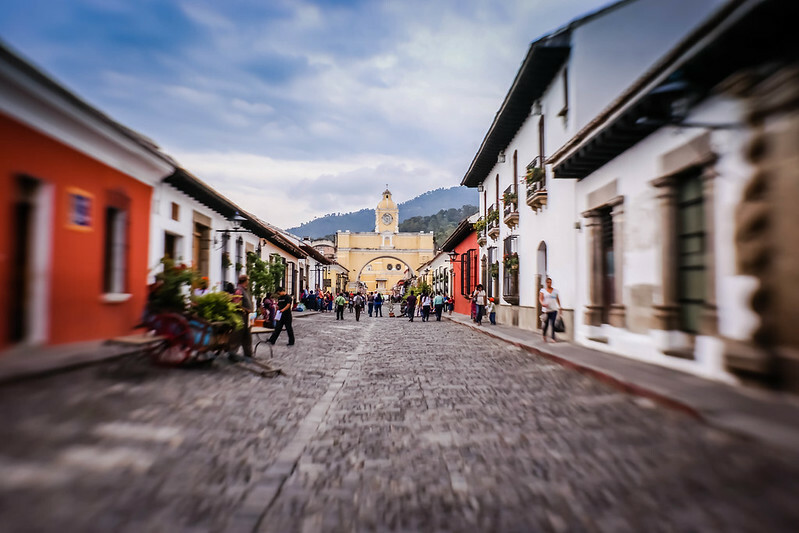 On our recent trip to Guatemala, we found ourselves more often than not in Antigua, the country’s former capital and a cobblestoned collection of colourful lowrise Spanish-colonial style buildings. Antigua is beautiful; surrounded by waves of lush green hills and the cones of perfectly shaped volcanoes, the buildings sit like a handful of multi-coloured gems in the bottom of a green velvet pouch. And yet, for all its outward beauty, we didn’t love Antigua. Mother nature has not been kind to Antigua. 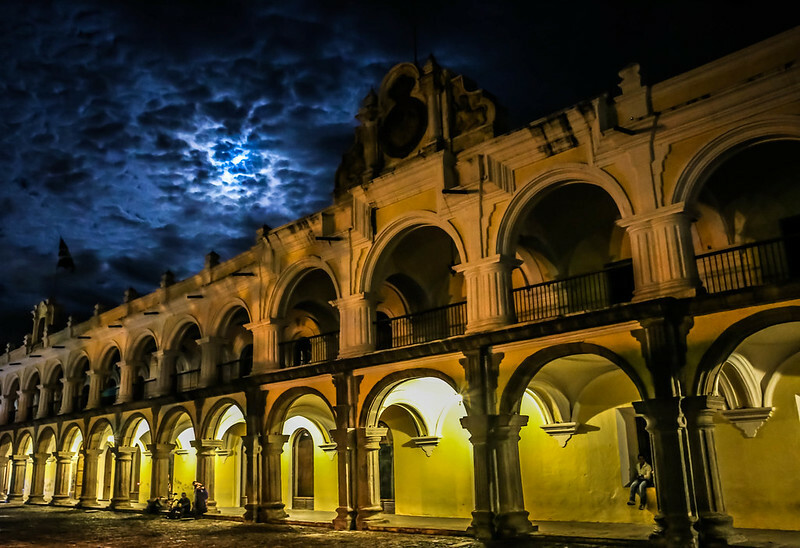 It became the third (or fourth, depending on your source) capital of the Kingdom of Guatemala, a region spanning from Costa Rica to the Mexican state of Chiapas in the north, in 1543. 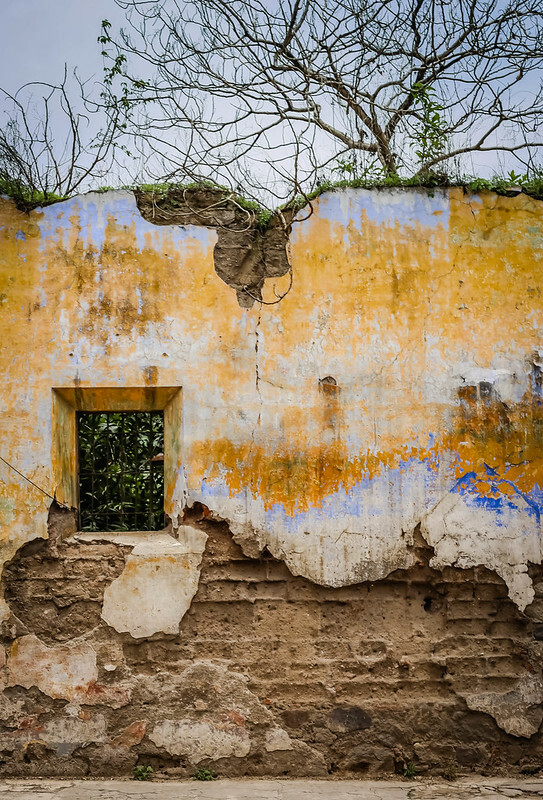 This was after the second capital, Ciudad Vieja, was destroyed by a catastrophic volcanic mud flow, viciously hurled from the mouth of the nearby Volcán de Agua. For 200 years, fortune smiled upon Antigua: it became one of the richest cities in the Americas and the population grew to a height of around 60,000 (around double today’s population). A 1717 earthquake destroyed around 3,000 buildings, but authorities decided to rebuild the capital. 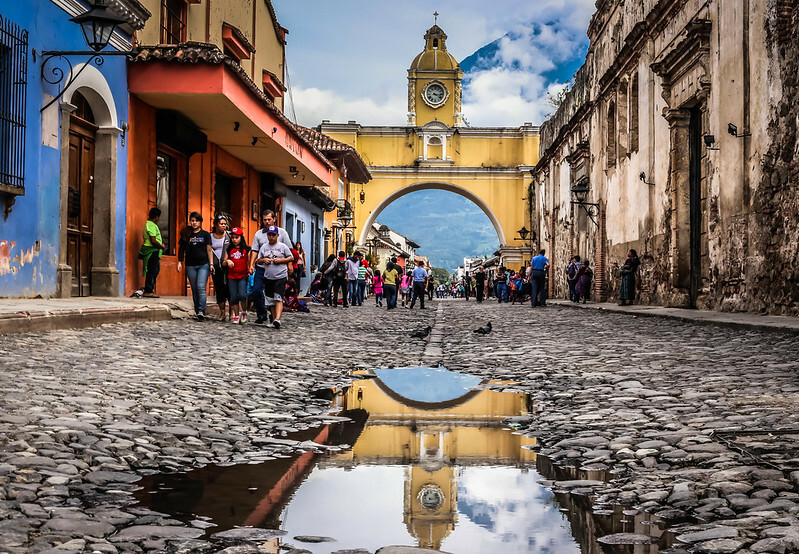 Then, fifty-something years later, from July to December 1773, a 7.5 earthquake and series of aftershocks lasting five months methodically destroyed the capital, convincing authorities to once again move the capital of Guatemala to what is today Guatemala City. Today, it seems fortune is beginning to smile upon Antigua again. The long-time expat residents and dedicated Guataphiles may disagree, and one openly lamented to me how much it has changed in the last 15 years: it is filled (or overrun, depending on your perspective) with foreigners enticed by the multitude of cheap Spanish schools, wifi-enabled cafes, aesthetic appeal, and relative ease of life; the streets aren’t particularly safe after dark, and it’s not uncommon for thieves to wait for drunken foreigners to stumble out of nightclubs and follow them home, only to jump them in a dark area and rob them of all their possessions; and the sight of Mayan men, women, and children pestering tourists to buy textiles, wooden flutes, and cheap bracelets suggests the growth of the tourist industry has brought with it other challenges. And yet, it seems to be mostly prospering: many restaurants, cafes, and hostels are run by youngish entrepreneurs, and the whole place has an easy like Sunday morning, gentrified appeal about it. And yet, we didn’t love it there. The past few months have had us both running at full-speed, and we were exhausted when we got to Guatemala. I was excited to be there, but mostly I wanted a slower pace than I’ve been afforded over the past few months. I had a taste for hanging out and relaxing, and Antigua is a prefect place to do that. 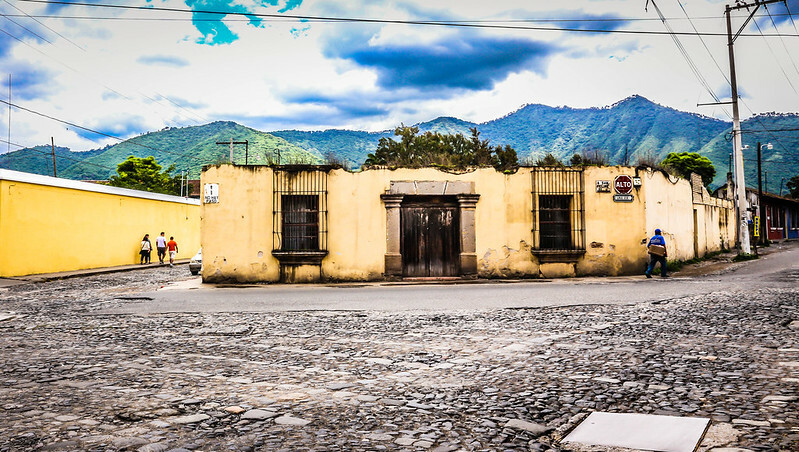 To be honest, there’s only so many Spanish-colonial towns I can see before they all look the same, and I start to go, meh. Yes, it is beautiful. Yes, it is surrounded by volcanos. And yes, the coffee is amazing. But overall, I found Antigua to be a bit vapid. Have you been to Antigua, and what were your impressions? Tell me in the comments. Bram | Travel. Experience. Live. Thanks, Bram! Long time, no talk – we LOVED your story about crossing the North Sea on the cargo ship…traveling via cargo ship is kind of a dream of mine (Katie), and I’m pretty sure it’s a dream of Geoff’s too (Geoff hearts ship!). We *might* be in Europe toward the end of the year…maybe timing will work out that we could meet up! I think I found your post because I googled something like ‘am I the only person who doesn’t like Antigua?’ I’m in Antigua now, and the volume and types of tourists & expats are extremely off-putting. Pretty town, but I’m travelling to experience places like this. 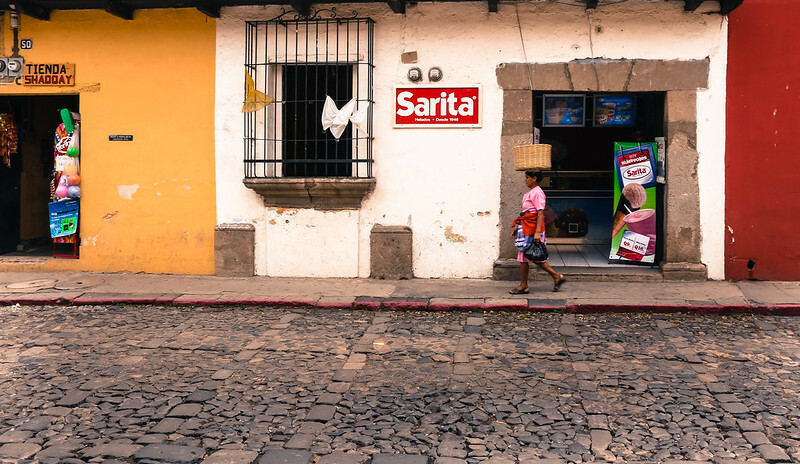 Flip side – many gringo business owners mean more work opportunities for those who are not yet fluent in Spanish. These pictures are out of control beautiful, even if the city wasn’t so thrilling. My husband and I are thinking about moving to Antigua with our 3 year old boys. We’re worried about the safety. You mentioned the streets weren’t safe at night and I’m imagining that was a contributing factor to why you didn’t fall in love with it. I would love your two cents – I’m very worried about the safety of my kids there. Were you worried about personal safety or was it more property crime? I’ve read that Guatemala is the 7th deadliest country in the world and that there are violent gangs in Guatemala. Are they prevalent in Antigua? Thanks for the note. Safety-wise, we didn’t find particularly unsafe at night in Antigua, and saw no sign of violent gangs or anything like that. From what we heard while there, it was more property crime, and (again – this is what we heard) often it was people targeting foreign visitors when they were drunk coming out of the bars to rob them of their money and electronics. As a young family, I doubt that would be a problem for you! There were many, many expats living in Antigua, and some families as well. We didn’t love Antigua more because it just didn’t stand out for us as visitors as somewhere that is spectacular compared to other places we’ve visited – it is a beautiful setting, but was really quite similar to other small cities we’ve been to in South America in terms of the aesthetic. That said, we would consider settling there for a time to work or learn Spanish, as it was quite a comfortable city with many comforts. I’d be more interested in living there than visiting. 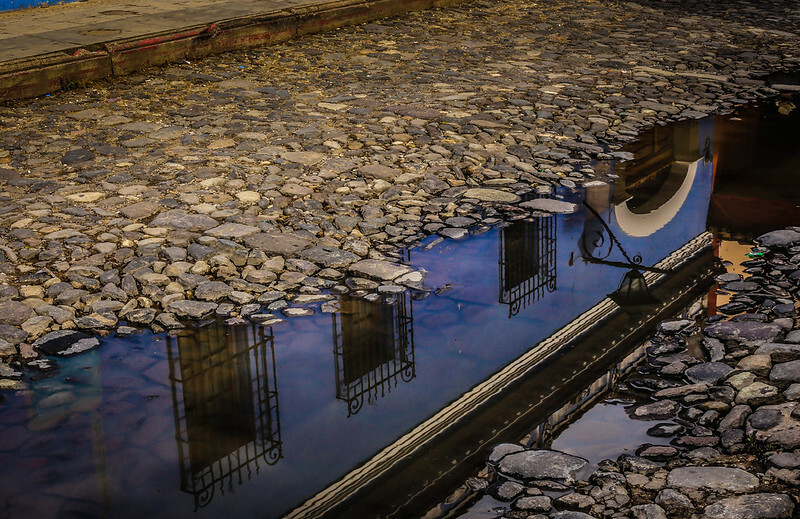 In terms of safety in Guatemala as a whole, I would say that in my opinion, Guatemala city is a whole different ball game compared to Antigua or the rest of the country. We felt safe throughout Guatemala, including up near Tikal which is one of the areas that used to have vanjackings. In Guatemala city, however, we did not feel particularly safe outside of the upscale “expat” area. I hope this helps and good luck! Well Hi there, reading the post i just wat to add that for me, Antigua was a total disapoinment. At first, the easy going, nice weather and very human size city liked a lot, but after being there for a while, we feel that just wasted some of our time. Property it´s very expencive, groceries are cheap at the market, but low quality, dirty and the ever present fear of thieves… Night life it´s impossible, drunken, violent youths everywhere, and just filth in everycorner. Everything we tried to do, became a problem, from buying a hause to buying furniture, a car or just anything, because affordable it´s just the very cheap stuff, everything else it is twice the price of the US. But above all, the constant worry of being robbed it´s just overwhelming!!! You cant leave the hause empty for a weekend, you can´t park in many places, because there are some 10 to 15 cars stolen a week, you can´t use your laptop in a park, someone said not to use my expencive camera in public, couse could got stolen. All in all, we just got out of the charming town and let more romantic fellows believe that life could be nice being afraid all the time. I visited Antigua for my first time last month and really loved the city. 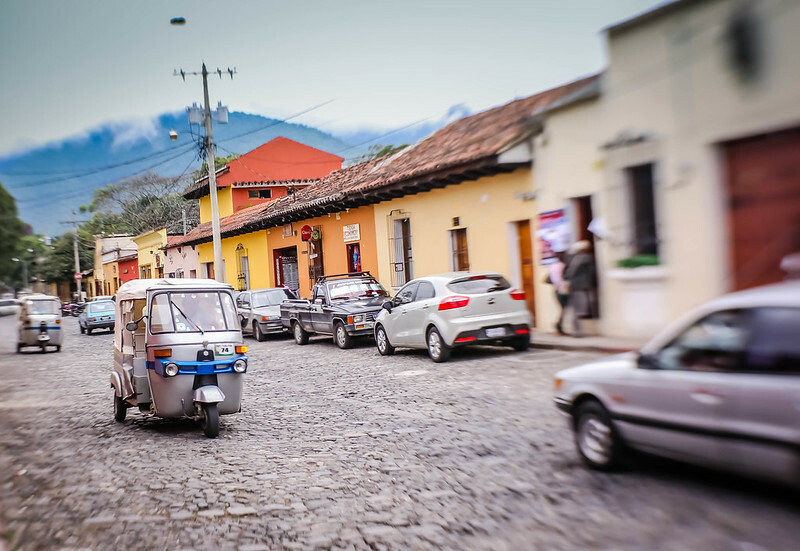 Even though it is obviously very polished, clean and tourist-oriented and not the “real” Guatemala, I found it to still retain an authentic and charming feeling. There were definitely tourists but I didn’t feel like the city was overrun by tourism. 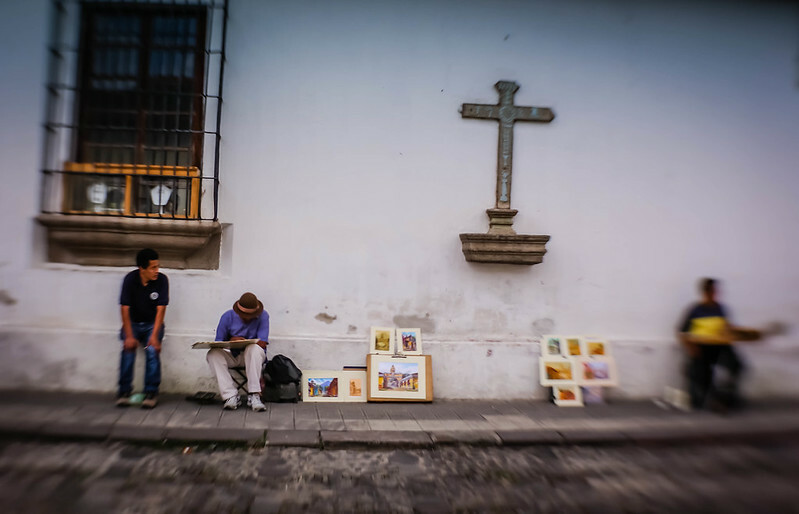 I loved wandering the quiet cobblestone streets and photographing and exploring the beautiful colourful buildings, colonial architecture, and gorgeous churches and convents. It was such a pretty city, easy to walk around, and was surrounded by such breathtaking landscapes. Your photos in this post are amazing! Really well-done. 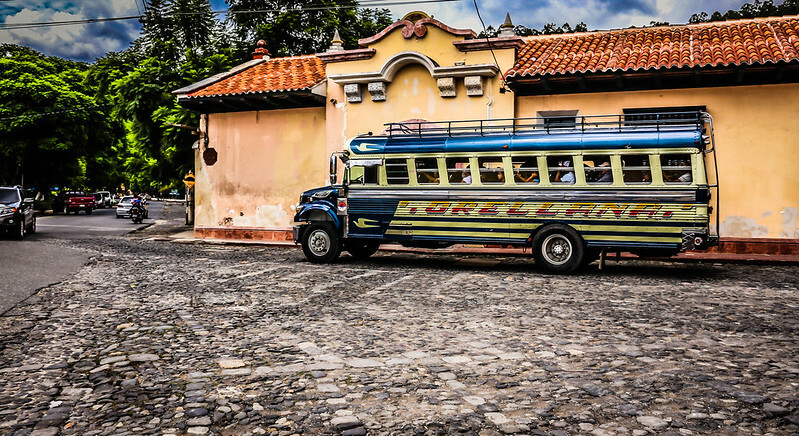 What was your favourite area of Guatemala? Glad to hear you liked it, Brittany! 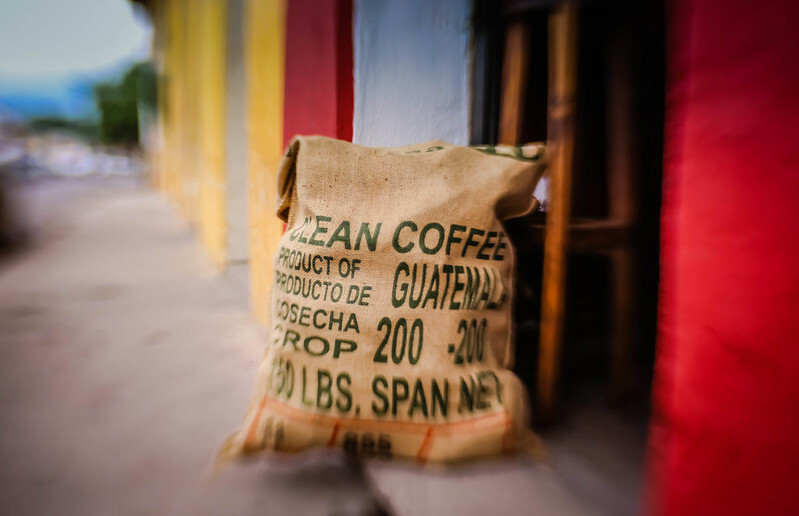 In all honesty we weren’t really feeling Guatemala – could have just been the frame of mind we were in, but it wasn’t one my favorite places I’ve been. Tikal, however, we both absolutely loved – hope you made it up there? I have been going back and forth to Antigua for about ten years. I am comfortable in Guatemala. 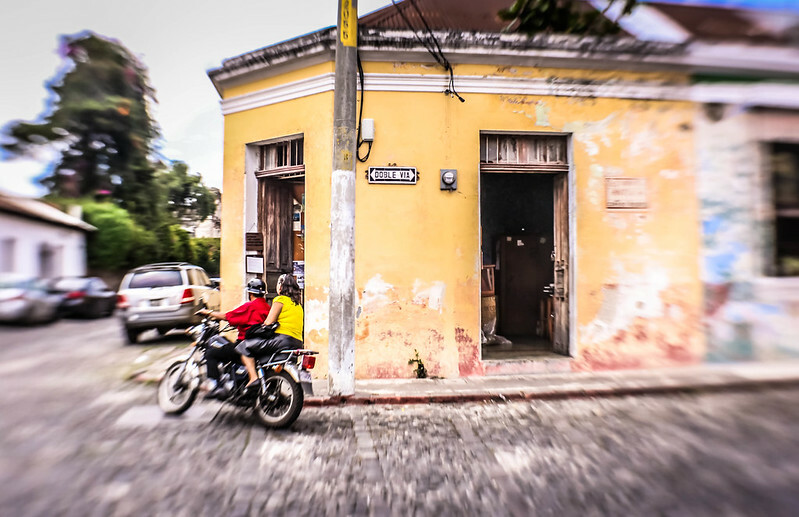 I have gotten ripped off more times than I want to think about…..from rigged ATMs to an IPhone swiped on a bus….Antigua to me is one big hotel, store and restaurant…..even in the Parque the vendors are relentless so not much peace there. 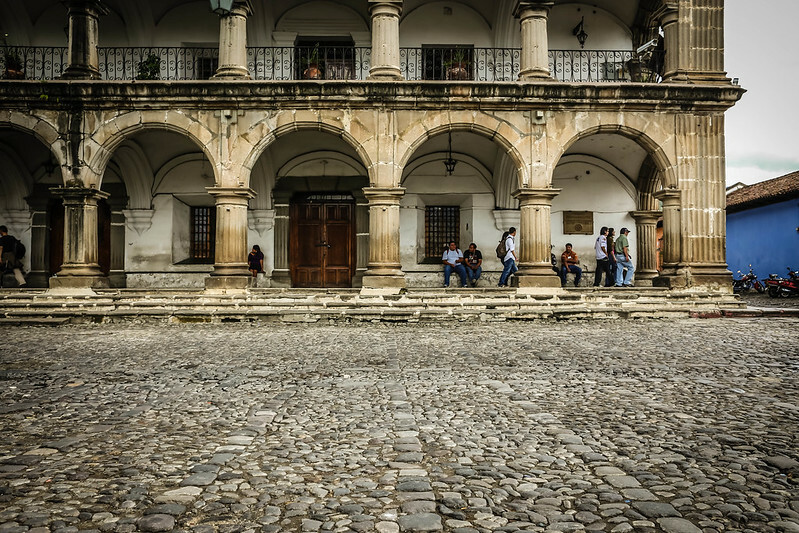 The Parque is the place to meet and chat with other gringos and Guatemalans alike. I go to Atitlan from there and I do like it there….stay in a secure apartment and life is good. it’s a cool country, just keep your wits about you.